We are delighted that you are interested in hosting your wedding at the Nottawasaga Resort! If you would like to schedule a time to come in to view our facilities, please fill out the following information. Comprehensive wedding packages start from $68.95. Please see our Wedding Trousseau Kit which will provide you with an overview of the wedding menu and service choices available for your wedding day. On Sunday February 24, we invite you come and experience our beautiful resort setting at our wedding open house. 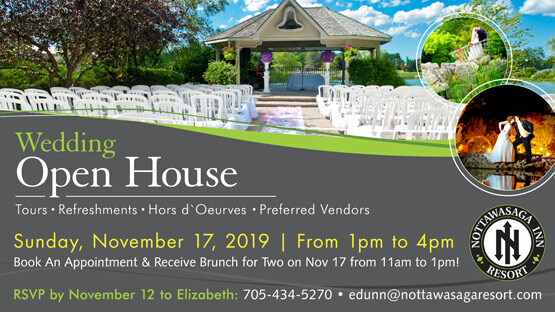 There will be tours, hors d'oeuvres, refreshments, an opportunity to meet with our preferred vendors and onsite wedding coordinator. RSVP by February 19 to Sarah by telephone at 705-434-5270 or by email. Please note that an RSVP is required to reserve your spot and to receive a free brunch for two on the morning of the Open House.